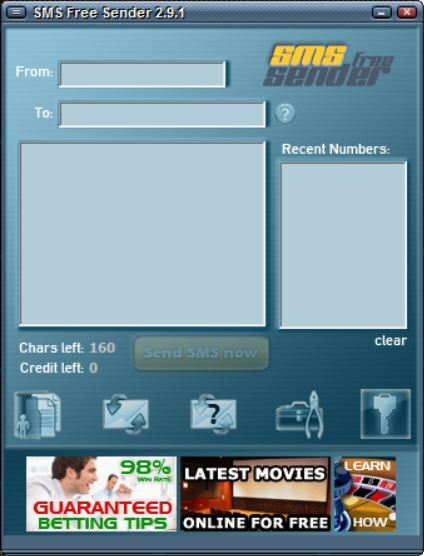 "Send free sms messages from your computer with SMS Free Sender." Got a message that you need to get out, quick and to a bunch of phones at one time? 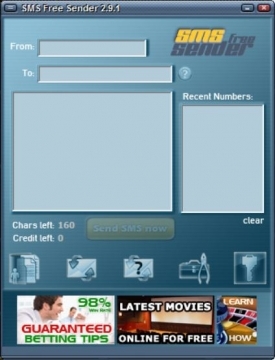 SMS Free Sender can help you as its application serves to handle large messages being sent to large amounts of people. And it does it for free. It enables you to save time because you can simply type your message from the comfort of your Windows PC and not have to move from your seat. With SMS Free Sender, you can send free SMS messages to anyone you want and the developer advertises a fast and reliable message delivery as high powered gateways ensure reliable delivery of all of your messages. The developer also advertises that this same delivery service is used by more than 10,000 business customers. Customer service and support is also available for you as an experienced team is on standby to assist you with any related issues that you may have. Not every application is perfect, though. And I noticed some issues myself when testing SMS Free Sender. For starters, the application took a very long time to install, in fact, it was still installing at the time of this review. When I opened the application, I was unable to use it and there were no hints or helping dialogues to guide me. I hope that this is just an issue with the recent version of the application and not an ongoing issue. For now, the application gets a low rating from me. Maybe a future update can fix these issues.